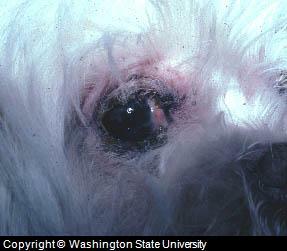 Puffy dog eyes is a symptom, which is represented by swollen, enlarged or protruded eye balls. This can occur in whole eye or in a specific part of the eye, such as eyelid swelling, eye ball, eye socket or orbital. The dog eye condition can be found in and effect the entire anatomical make up of the eye. Most commonly, puffiness is noted bilaterally (in both dog eyes), but may occur in a single eye if the cause is mechanical (problem with dog eye anatomy) and not pathogenic (caused by disease). It has been noted that puffiness in dog eyes is most commonly caused by some type of inflammatory response, which can occur in cases of trauma, allergy, infection or some specific underlying ophthalmic disease. Allergies have been recorded as the most common reason for all pathogenic etiologies (dog eye problems). Food allergies, wasp bite allergies, parasitic allergies and some seasonal allergies can cause swelling and eye redness as accompanying symptoms. Debris, pollutants, pollens and weather harshness are other reasons for localized allergies in dog eyes, which can cause swelling. Infections such as conjunctivitis, blepharitis (eyelid inflammation), scleritis (inflammation of the outer layer of they eye, covering the eyeball) etc. are some causes of dog eye swelling. Infections are represented with classical dog eye symptoms such as inflammation, which includes swelling and discharge mixed up with pus. In eye infections, allergies and other minor pathogenic conditions, even though dog puffiness is an initial or symptom for most pathogenic dog eye conditions, puffy eyes is not considered a specific or main symptom. It is an accompanying or non specific symptom that does not indicate the underlying cause of the canine eye problem. Mechanical injuries, blockages and the development of dog eye tumors are other reasons for puffiness. Swelling is either noted due to an inflammatory response or occurs due to progressive pressure generating parts of the eyes. Tumors and blockages in tear drainage and mechanical anatomical deformities can generate pressure on various parts of the eye, causing it to appear swollen or protruded. In such conditions, pain is a major accompanying sign. In some systemic diseases, commonly endocrine diseases, dog eyes may appear enlarged or swollen due to abnormalities in hormonal secretions. In such conditions, puffy eyes is usually the only eye related symptom noted. Dog puffy eyes is a clinical representation of some type of dog eye problem, but due to its association with almost every eye condition, it is considered a non specific symptom. Even though it is a non specific symptom, it does have clinical importance because most dog eye problems are clinically initiated as puffiness or swelling of both of the eyes. Dog puffy eyes are not only the initiating symptom for dog eye problems, but also it can help in assessing the severity or status of any condition at a clinic. Accompanying symptoms such as redness, pain, discharge, irritation, mechanical protrusion of the eyes etc. can help in identifying the possible cause of the dog eye problem. Dog puffy eyes on the other hand being a non specific symptom, can only help in assessing the severity and clinical status of a canine eye problem. Swelling or puffiness in dog eyes is a non specific symptom. Clinically, a dog eye problem is initiated with this symptom followed by other signs such as dog eye discharge, redness, irritation, pain, pressure and any inflammatory responses. In advances stages of any problem, dog puffy eyes is a helpful symptom in assessing the status, severity and results of therapy. Underlying causes of dog puffy eyes are diagnosed through clinical examination, history and several laboratory tests and procedures. In a laboratory, different procedures such as tear tests, culturing and isolation of microbes, radiography etc. might be needed for confirmation. Common causes are usually diagnosed through clinical examination and basic tests only. Canine puffy eyes is a symptom that can be treated by using specific therapeutics used for reducing the effects of any symptoms. Canine eye puffiness that is caused by inflammation or stress due to allergies and infections are treated with anti inflammatory drugs, administered in the form of dog eye drops or ointments. Also, care and prevention of causative allergies and eye irritants is recommended during treatment. Underlying causes are preferred to be treated through specific therapy, which is accomplished with antibiotics and other specific therapeutics. Additional procedures such as surgical drainage, correction of anatomical deformities and excision of dog eye tumors might be required, according to the confirmed diagnosis. At home, simple dog eye puffiness can be managed with the help of remedies, such as the application of soaked tea bags around the eyes. Similarly, cooling the surface with the application of mint can also help to reduce symptoms such as swelling. Home remedies should only be applied after consultation with a veterinarian. Supportive care is also needed for healing and recovery. Care during treatment and the prevention of allergens, irritants and light is often required. Additionally, to hasten recovery and to support overall eye health, natural extracts are not only effective as a supportive part of the specific therapies recommended by your veterinarian, but can be used to treat minor cases of allergies and dog eye puffiness. Natural remedies to consider include i-Clenz, which can be used to safely clean the area around the eyes and Eye Heal, which can be used over the surface of the eye to improve eye health, healing and any specific therapy recommended by your veterinarian.